2019 Let's Play! Company Invites Local Playwrights To Share Their Work | Flashback Theater Co. This February, Let’s Play! Second Saturday will continue the 2019 season with a special theme, Playwright’s Choice. Sommer Schoch, the Producing Artistic Director of Flashback Theater (FbTC), will lead an evening filled with reading and performing scenes from plays produced by local playwrights. The workshop will start at 7:00 PM on Saturday, February 9th, and will be in the Black Box at Flashback Theater. The event is free to attend, and audience members and actors of all ages and experience levels are invited. At this event, playwrights can share their work with performers and audience members for valuable feedback. Local playwrights are invited to bring scenes from their works to the workshop; performers will then rehearse the scene and perform it for the audience. Those who attended previous Playwright’s Choice workshops may remember the rehearsal process for the scenes chosen. Those who are new to Let’s Play! will have no pressure or fear; the event will have directors to lead the performers and guarantee a fun experience. Playwright’s Choice features many opportunities to learn about theater and the rehearsal process. 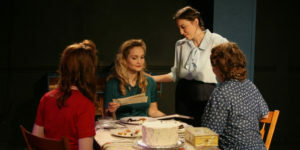 Reading, workshopping, and producing plays is beneficial to actors and directors because of the teamwork involved; actors and directors can evaluate and test the work while letting the playwright see their work come to life. Often, changes in the script result from the playwright seeing a live reading and is essential to getting a play ready for full production. Playwrights who are interested in participating should bring copies of a drafted script with them to the event. There should be a script for every character in the scene, along with two extra copies for the director and playwright. As always, Let’s Play! encourages theater artists of all ages and experience levels to participate. Actors, administrators, and audience members interested in the event need only show up. By the end of the night, everyone should have had a chance to participate and collaborate. Audience members who attend the Second Saturday workshops may recognize, and even get to know, some of Flashback’s performers. FbTC takes pride in developing local talent; Our actors are active members of the community who love welcoming new faces to the group. FbTC encourages audience members to come and learn about performing arts by watching or, if they’re inclined to do so, participate. Everyone is welcome in the theater! Flashback Theater is a place where everyone can come to enjoy themselves. Playwright’s Choice allows the community to learn about theater without experience or pressure. Writers can watch their work come to life. Participants can direct, perform, and share their creativity with the audience. Audience members can sit back and watch different scenes and the process that goes into creating a play. Most importantly, everyone who comes will enjoy an evening of relaxation, fun, and education. We encourage everyone to attend the Second Saturday workshops all year long. February 9th at 7:00 p.m.